I'm sure glad that I'm not a kid going to school these days. With yesterday's latest school shooting at Santa Fe High School in Texas, there's been 31 incidents of guns going off in schools across the nation this year. 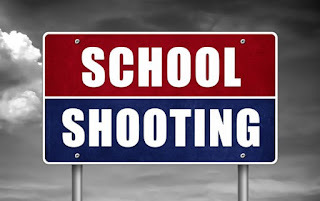 These school shootings are like a deadly version of the 1993 movie, Groundhog Day. Once again a disturbed white boy who lived and breathed guns, 17-year old Dimitrios Pagourtzis, has chosen to murder his classmates in dramatic fashion. Do you find it disturbing that I said, once again a white boy is the killer? Don't. How many of these school shootings have been done by people of color? I'll wait while you look, but I can save you time and say the answer is...zero. Imagine if one of those shooters were Black or Hispanic? The uproar would have triggered riots against people of color until the next decade. That's the nice thing about white privilege in America. You get a pass on a lot of things. As politicians and the NRA scramble to put a spin on this latest attack, there's one thing we can count on...nothing will be done. No bills passed. No new safety measures. It doesn't matter if it's 16 students slaughtered, or ten; politicians will crawl into their protective shells and wait out the flak from an enraged majority of Americans. We know Trump won't do anything about gun control. He showed us that after the Parkland massacre. His tough talk about not being afraid of the NRA was just another Trump joke on us. Remember what happened? The day after he teased other politicians about being afraid of the NRA he met with their leadership - in the Oval Office - and went on to do exactly nothing to reign the gun group in. Watch how the Trump administration pretends its going to do something about gun control after this Texas shooting. Expect more lies to calm the public down. And more false prayers. Just don't be fooled; there will be no gun control in this country until Trump, and the NRA-beholden Republicans (think Marco Rubio) in Congress are run out of Washington DC.